Now, more than ever, consumers are paying attention to their food. According to a survey from Boston-based consultancy C Space, 76 percent of consumers are checking ingredients, 51 percent of consumers are checking where food comes from and 42 percent of consumers are looking for specific trustworthy claims. In fact, 43 percent of consumers say that labels on food can help brands win their trust. And brands could use some help. A recent study from global advertising agency Havas reveals that only 25 percent of consumers trust food brands to provide them with healthful products. In what is good news for consumers, food regulators are forcing consumer packaged goods (CPG) companies to provide more detailed nutritional information about the foods they are eating. For example, in the United States, the Food and Drug Administration (FDA) recently announced a new Nutrition Facts label for packaged foods to make it easier for consumers to make more informed food choices by highlighting important information such as calorie count reflecting new scientific information, including the link between diet and chronic diseases such as obesity and heart disease. Food manufacturers will have until July 26, 2018 to comply with this new regulation. However, simply adapting to these types of changes in the industry isn’t enough. If food and beverage brands want to truly earn consumer trust, they can’t just keep up with regulation—they need to get ahead of it. Through strategic partnerships with packaging leaders such as Crown and WestRock, EVRYTHNG is currently enabling billions of physical food and beverage products to be manufactured with a digital identity in the cloud. Using a smartphone, consumers are able to interact with these #BornDigital™ food and beverages to trigger real-time applications and content, including a wealth of nutritional information far beyond the details provided by a standard, regulation compliant label in the limited amount of label real estate allocated to house such large amounts of information. According to a Nielsen study, less than two-thirds (63%) of global respondents trust health claims on food packages, and the percentage is only lower in North America (56%). In order to earn back consumer trust, brands can back up these health claims by delivering additional product information. Instead of labeling a product as “organic” brands can let potential buyers know exactly how a product was made and how it lives up to the label. 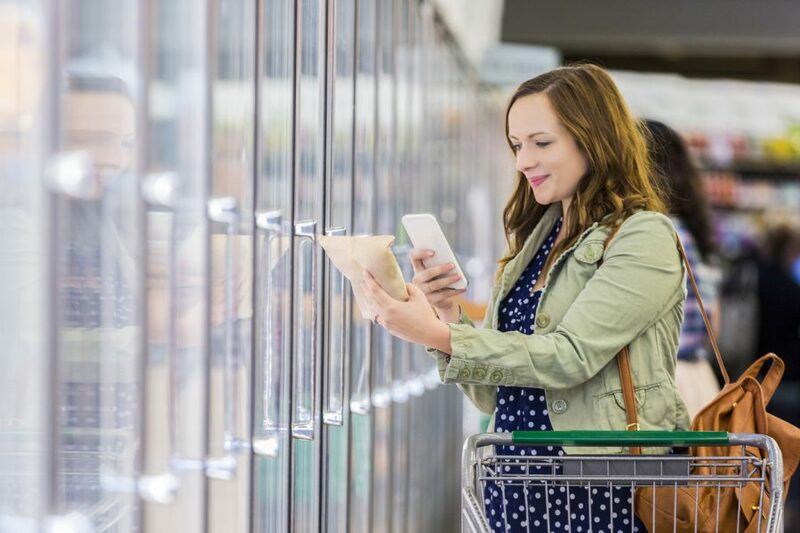 Today’s food shoppers are empowered consumers, equipped with a secret weapon: a smartphone. At any given time, they’re using this tool to understand nutrition labels, learn about individual ingredients and make the right decisions for their diet. Why not hand over all of that information on a silver platter? Why not turn this smartphone interaction into a force for greater brand transparency—and an avenue for building up consumer trust? If food and beverage brands want to earn back consumer trust, they can’t just comply to new industry regulations as they arise. They need to make it incredibly easy for consumers to find all of the product information they need to make the healthy choices they deserve.